The Anglican Archbishop of Perth, Roger Herft, has resigned after admitting he let down survivors of sexual abuse, reports the ABC. Archbishop Herft had been Archbishop of Perth since 2005, but stood aside in October to "focus my attention on the royal commission's ongoing inquiry into the Diocese of Newcastle." He gave evidence at the Royal Commission into Institutional Responses to Child Sexual Abuse in August, and finished his testimony with an apology to the people of Newcastle, where he served as bishop between 1993 and 2005. "I've become aware that the sacred trust that the people of this region placed upon me, I have let them down," he said. "I let them down badly. "[I have] let down the survivors in a way that remorse itself is a very poor emotion to express." 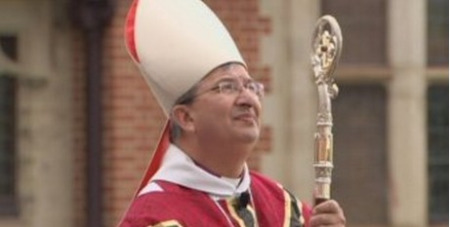 Archbishop Herft thanked the royal commission for holding him "personally accountable" during the hearing, which stretched over two weeks. At the time he described how he had developed a "much more realistic view" of the priesthood in recent years. The Archbishop also added that he hoped first-hand accounts from survivors would lead to widespread change within the Anglican Church. He has been on long-service leave since finishing his royal commission testimony, and will take accrued leave until he retires in July.